That is awsome. I almost wnat to make one of my own. i want to HATE and LOVE it all at the same time!!!! Ahaha, I did the exact same thing... They work perfectly for that! I also used the treads for Nob Bikers. The Toy 'R' Us near me had them on sale for $2.99 so I bought like 30 last year. Bringing death and dismemberment to all while cleaning the environment. Looks incredible. Though I like the name, I think Waaagh-L-E may be another good name. Seconding Waaaagh-L-E as its name, that's as awesome as the mini!!!! Man, this is insane. I would die of laughter if I wasn't so awestruk by your genious. Hahahaha! This is amazing. Where did you get the eyes from? What about a whole squadron? 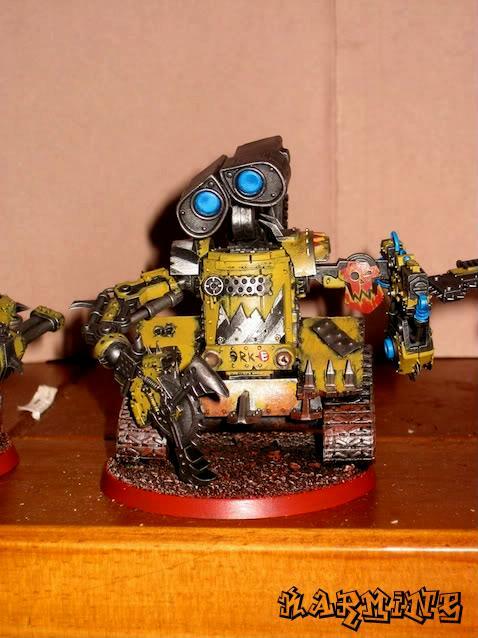 or even a Wall-E stompa, based on the bigger ones inside the spaceship in the film?! Even Wall-e meganobz1 Wall-E!Wall-E! ahem. Awww, He's so cute but deadly! @Lord of Timbraxia: The eyes are from the toy...can't you see they are just Wall-e's eyes repainted? Don't get too close or get cubed! This will sure strike fear into the hearts of the enemy! Im kinda p1ssed These are my photos and my models, whoever this karmine is, he is lying through his teeth! He did not make these, he did not paint them he did not take the photos, and he did not have anything to do with them! He is stealing my ideas and pictures, im not happy! Do you still have the original versions of these pictures? It would be nice to swap out the watermarked version. Disney's lawsuit it pending I'm sure. This is freaking awesome. Ork force name: BUY 'EM LARGE!! I can just amagen this thing saing "wwAAaag-y" as it compresses a squad of marines.